Background: The book from which this section is taken was intended to provide a citizenâ€™s handbook to the Third Reich, with many pictures illustrating the way Nazi Germany worked. This section presents the “Jewish Question” from a Nazi viewpoint. Citizens are told that Nazis measures against the Jews are reasonable and defensive — but there are also hints of what was to come. 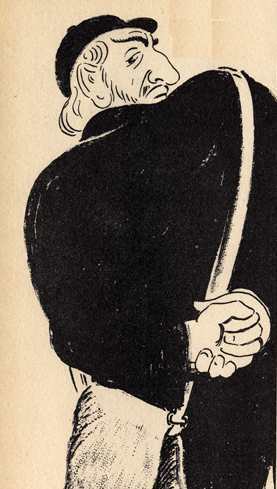 The source: Max Eichler, Du bist sofort im Bilde (Erfurt: J. G. Cramerâ€™s Verlag, 1939) pp. 139-142. The Jewish Question is as old as the history of Jewry itself. From the days of antiquity to the present, peoples have always risen up to defend themselves against Jewish parasitism. The defense was often bloody. Greater Germany is the first country in the world to find a legal way to separate from the alien Jewish people. In contrast to the views of the last century and of the so-called democrats of today, National Socialism sees the Jewish Question not as a religious problem, but rather as a racial question. After Jews had been removed from the civil service and the press and cultural life had been cleansed, the most important step was the Nuremberg racial laws (see pages 36-47!). The world paid attention. It saw that it was no longer a matter of theory, that it was not merely the anti-Semitism of an earlier age, but rather that the final reckoning with Jewry had begun. World Jewry also realized the inescapable fate that faced the Jewish people. For the first time in their history, the Jews faced a movement that transcended all borders and oceans, one that could no longer be stopped — regardless of whether other peoples resisted or hesitated. The world-wide boycott movement against National Socialist Germany, the war agitation of the world Jewish press, and the gunshots by Jewish murderers that killed Wilhelm Gustloff and Ernst vom Rath, proved that. National Socialism fights its battles to a victorious end with iron determination. It will solve the Jewish Question in a way it thinks right for the German people, regardless of the deadly enmity and songs of hatred on the part of the Jews and their democratic friends. It will do this legally, but without compromise, and finally. It is no accident that the German people was called to do this. No other people gave the Jews such opportunity to carry out their drives as did the German people in the midst of its deepest need. No other people is strong enough to give the Jews the fate they deserve as is the German people! As in so many other areas. National Socialist Germany has given the rest of the world the example of how to deal with the Jewish Question, as is shown by the racial laws of our ally Italy, and by the spread of the Jewish Question to many other countries. The murder of Ernst vom Rath did not slow legal measures aimed at solving the Jewish Problem, but rather sped them up. The Jews living in Germany had to pay a fine of a billion marks to discourage them from repeating the cowardly murder. Jewish-democratic voices abroad complained about the “poor” Jews. Yet after six years of a National Socialist government, the 700,000 Jews in Germany were worth 8 billion marks, while the nearly 80 million German citizens were worth only 200 billion marks. Each Jew on average had 4.57, or four-and-a-half times, as much as the average German. Jewish net worth, which had been 4 billion marks in 1918, had doubled, at the expense of the German people. Jews also owned substantial property (for example, more than half — about 60% — of Berlin belonged to the Jews, although they were only 3.8% of the population). That proves the extent to which Jewish parasites had exploited the German people. Truly, it is only a small bill that the National Socialist leadership of the German people gave to the Jews. The series of laws and regulations laid out on the following pages bring us nearer to a solution of the Jewish Question in Germany in every regard. Jews are prohibited from owning shops, mail order firms, or branches, and from owning an independent craft firm. They are further prohibited from offering goods or business services at markets, exhibitions, or trade fairs of any kind. A Jew can no longer be a factory director, a leading official, or a member of a cooperative. Shops, mail order firms, and branches owned by Jews are to be closed down and eliminated. Only in particular cases can Jewish firms be aryanized. The same is true for Jewish craft firms. The Jews were excluded from six branches of industry in the summer of 1939 (security, information, real estate, housing and mortgage services, marriage services, foreign travel). Jewish commercial firms and the associated property, as well as wholesale operations and industry that are Jewish because of the degree to which they are under Jewish ownership, can be de-Jewdified. Important patents and commercial secrets must be transferred to Gentile control. Jews in the German Reich may no longer own or control property. Jewish stocks must be surrendered. Jews with German citizenship, or Jews without a nationality, are prohibited from acquiring, selling or disposing of items of gold, platinum, or silver, as well as precious gems and pearls. Jews are prohibited from attending German theaters, concerts, film theaters, etc. Jew may not attend German schools. They may only attend Jewish schools. Jews are restricted to their own Jewish artistic and cultural activities, which have been greatly expanded since the summer of 1933. The “Jewish Cultural Federation” has affiliates in all major cities, incorporating no fewer than 134 Jewish cultural organizations in every area of artistic life. The regulations implementing the Reich Citizenship Law bring Jews together in the “Reich Federation of Jews in Germany,” for which Jewish religious congregations serve as the local branch office. It has the purpose of encouraging Jewish emigration. It is also responsible for Jewish education and Jewish charity. It is responsible for educating the Jews by establishing the necessary number of public schools and secondary schools, as well as job training schools and courses that will assist in Jewish emigration. Jewish schools are supervised by the Ministry for Science, Education, and Public Education. Jewish clubs, organizations, and foundations can either be dissolved or incorporated into the Reich Federation. Jews are prohibited from owning or bearing firearms and ammunition, as well as daggers or swords. Driving motor vehicles of any type, as well as cars and motorcycles, is also prohibited. The Reich Minister has authorized the police departments of the provinces and their subordinates to establish regulations for Jews with German citizenship, or those with no nationality, that ban them from certain areas or limit them to certain times. For example, they may be banned from certain districts, or not be allowed in public at certain times. Jews may not serve as attorneys. A limited number of legal advisers are available to represent Jews. Jews may also not practice medicine. The legal situations of Jews as tenants or landlords is legally regulated. There may be no contact between German peopleâ€™s comrades and Jews. Bringing Jews together in exclusively Jewish apartment buildings is to be encouraged and sped up. If a Jew needs assistance, he must depend on his racial comrades. Jews may only have names that are typically Jewish. If Jews have other names, they must add and use an additional name (Israel for men, Sara for women). Mischlinge [the Nazi term for those of partial Jewish ancestry] — see p. 43! — are not subject to the new Jewish laws! The Duties of Jewish Mischlinge. Mischlinge are subject to the Labor Service and the military, but may not be leaders. Under exceptional circumstances, they may have responsibilities in civil defense. Medicine (also, a German married to a Jewess or to a Mischling, may not be a physician). Civil Service (Mischlinge may not marry civil servants. Exceptions can only be made in the case of Mischlinge, second degree [who were one quarter Jewish]). They may not be farmers, attorneys, editors, or newspaper publishers. Mischlinge may be craftsmen. They may also be pharmacists. Reich Air Raid Association (exceptions only for Mischlinge, 2nd degree). Mischlinge may be members of the German Labor Front and the GRG, but may not hold leadership positions. They may participate in KdF [Strength through Joy] events.